Adobe confirmed this morning something we had long suspected: Chrome is the most popular web browser. According to Adobe's analytics service, Google Chrome now accounts for 32% of web browser sessions in the US. This includes both mobile and desktop, and it represents a 6% year-over-year growth. Internet Explorer came in second with a 31% share, while Apple’s Safari, thanks to its vast mobile presence, is the third most popular browser, with a 25% share. With 8.7%, Firefox come in a distant but not too surprising 4th place. Mozilla's web browser has suffered a steady decline from nearly 20% market share three years ago; Adobe says that the decline is due to the lack of a mobile browser, but I say it a result of Firefox becoming increasingly less pleasant to use (I dislike FF so much that I am one bored weekend away from switching to Chrome). Adobe Analytics was used to detect the browsers for 17 billion visits to 10,000 U.S. consumer-facing Web sites in April 2014, and more than 1 trillion visits since 2008. 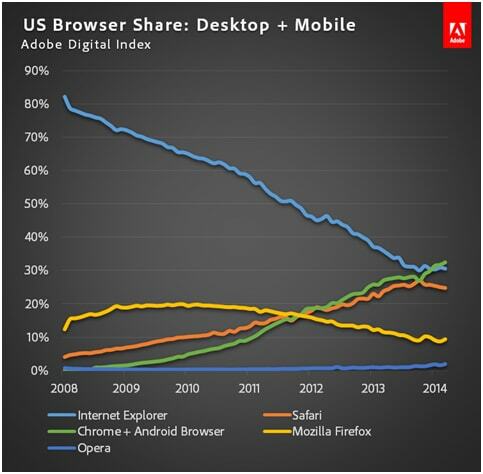 Market share figures represent the share of visits from each browser for the average U.S. Web site. So was anyone surprised to see Chrome come out on top? I'm not. Chrome has long been the more popular web browser for visitors to this blog, and what little data I have from the web analytics firm StatCounter confirms that Chrome has been the leading web browser since the third quarter of 2012. Of course, that is based on global web browsing sessions, and not US-only data like the Adobe data mentioned above. Curiously enough, even though Google has long since made Chrome one of the standard apps installed on all Android devices, it's not the leading mobile browser. With a 59% share, Safari still wins this category, followed by the stock Android web browser (20% share). Chrome comes in third with 13%, which just goes to show you that default installs are a powerful market force. Does this mean that the “Browser” on an Android phone is actually also Chrome? It is listed together here. The “Browser” on an Android phone is the stock web browser. It’s a different app from Chrome. Thanks. I think it should not be counted together with Chrome then. If they’re counting companies instead of browsers, it makes sense. I was surprised recently when I bought a phone that there’s no Browser anymore, only Chrome. It was bound to happen, Google has been aiming in this direction for a long time. It feels like Chrome is turning into another Internet Explorer, technologically better but very locked in. I had to remove it from my Mac. Makes it over heat and run the fans full blast. Not to mention eat up my battery life. Runs better on PC but it’s no longer as smooth to me their either. It’s been buggy, especially with Chromecast. Its mainly because its the only browser in which you don’t have to install a crappy flash player to see some content. I still prefer firefox. It seems to work fine and I have a nice collection of addons for it.